Mr. and Mrs. Halstead, of 25, Sutcliffe-street, Harle Syke, who last week received news that their son, Lieut. 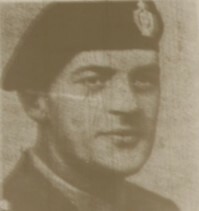 Harry Halstead, had been seriously wounded in the right shoulder on November 4th and was in hospital in Holland, have now been officially informed that he died on November 7th. Lieut. Halstead, who was 34 and single, joined the Coldstream Guards in 1930, and served in Egypt before becoming a constable in the Bury Police Force four years later. Called up from the Reserve in December, 1939, he was commissioned in October of last year, and had been serving with the Royal Scots Regt. He joined the British Army of Liberation shortly after D-Day. 1945 – HALSTEAD Harry of 25, Sutcliffe Street, Harle Syke near Burnley, died 14 November 1944 on war service. Administration, Llandudno, 15 August to Arthur Halstead, retired weaver. Effects £611 9s. 4d.